Meeting: 4-6 April Coverage: Live on BBC Radio 5 Live, Sports Extra and BBC Sport website - more details. 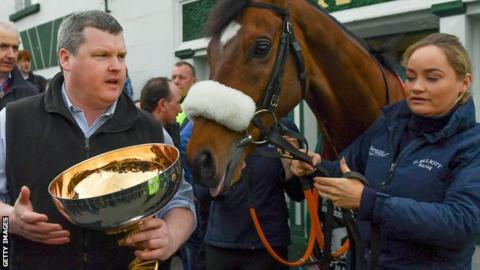 Irish trainer Gordon Elliott is set to have a record number of runners in the Grand National at Aintree on Saturday. Elliott has last year's winner Tiger Roll and 11 other entries guaranteed a run - should he wish - after Monday's confirmation stage. Elliott's mentor Martin Pipe holds the record of 10 National runners in 2001. Twelve horses, including 20-1 chance Ms Parfois, have been scratched, which leaves 69 entries. A maximum field of 40 will be named on Thursday. Elliott, who also won the race in 2007 with Silver Birch, has 12 entries in the top 40 and the current first reserve Bless The Wings, who was third last year. Aside from Elliott's team, leading hopefuls Vintage Clouds and Walk In The Mill are now sure of a place. Those withdrawn include Elliott's Alpha Des Obeaux, The Storyteller and Shattered Love, as well as Bristol De Mai, Blaklion, Abolitionist, Sub Lieutenant and Yala Enki. Tiger Roll is the 4-1 favourite to become the first horse since Red Rum 45 years ago to win the race two years running. Captain Redbeard is currently number 40 and guaranteed a run.